Remember the superbly EnchantInk time Isaac had at a creative writing course in March this year? The Monsters Under the Bed were kind enough to invite Isaac to join in the mayhem of monster hunting in MonsterHuntInk in June. Held at The Arts House, the location was central for all parents, and the venue felt very lush amidst the classical architecture of the building. Apparently, most of Monsters Under the Bed workshops and events are all held here. The last time we attended EnchantInk, it was held at the Singapore Discovery Centre and was a one-off use of that venue because The Arts House wasn't available at that time in March. Ooooh... The Arts House was definitely a nicer venue to have for the three half days we were to be there. 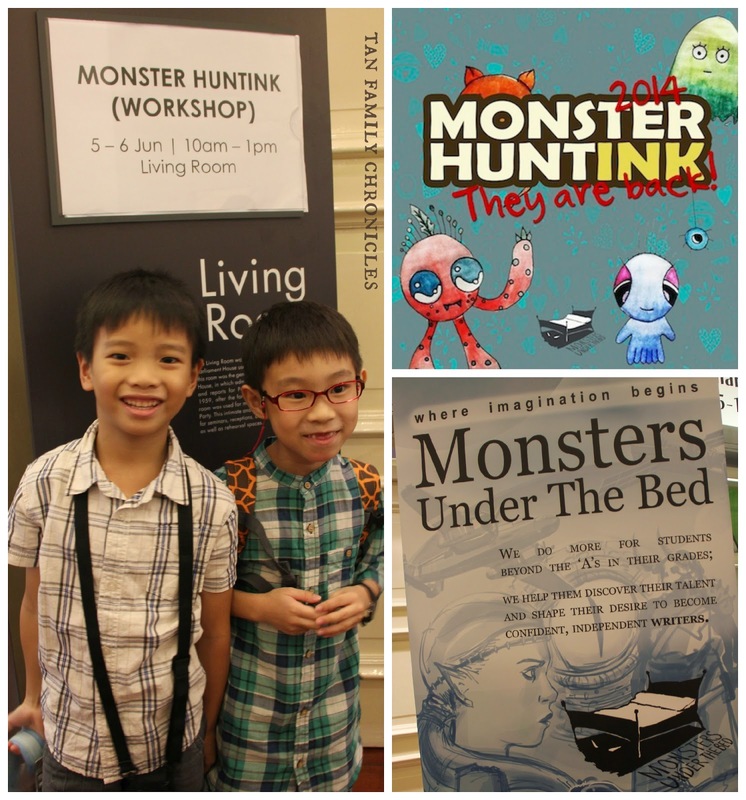 Monster hunting @ MonsterHuntInk with the Monsters Under the Bed! MonsterHuntInk was exactly what it sounded like: Monster Hunting! The kids were supposed to go monster hunting. But they weren't given a monster to go hunting for... no no... 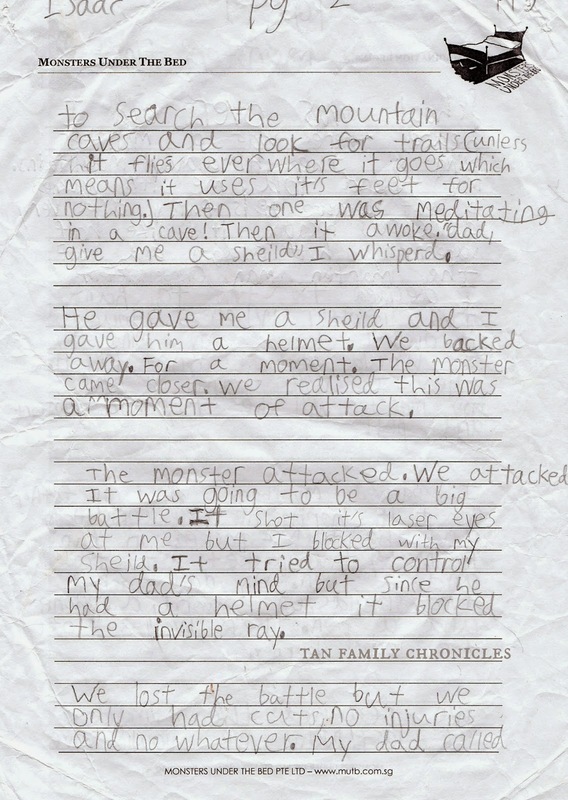 The kids were supposed to create their own monster, and hunter, and chronicle the entire quest of hunting down the monster. But in this day and age where Disney Princesses prevail, evil villains as handsome and charming as Prince Hans and monsters ala Monster's Inc look so cute and cuddly - would the kids know what a real monster was? No fear! The Monsters Under the Bed gave them all a quick crash course steeped in mythology to get to know the traditional monsters of the literary world, like Medusa, minotaur, ogre, Yeti, gargoyle... even cyclops. No, not the X-Men Cyclops, the original one-eyed giant monster cyclops that wasn't as cool and suave as Mr Scott Summers is. I bet most of the kids didn't even know that Cyclops the X-Men was named after this cyclops the monster, and not the other way round. 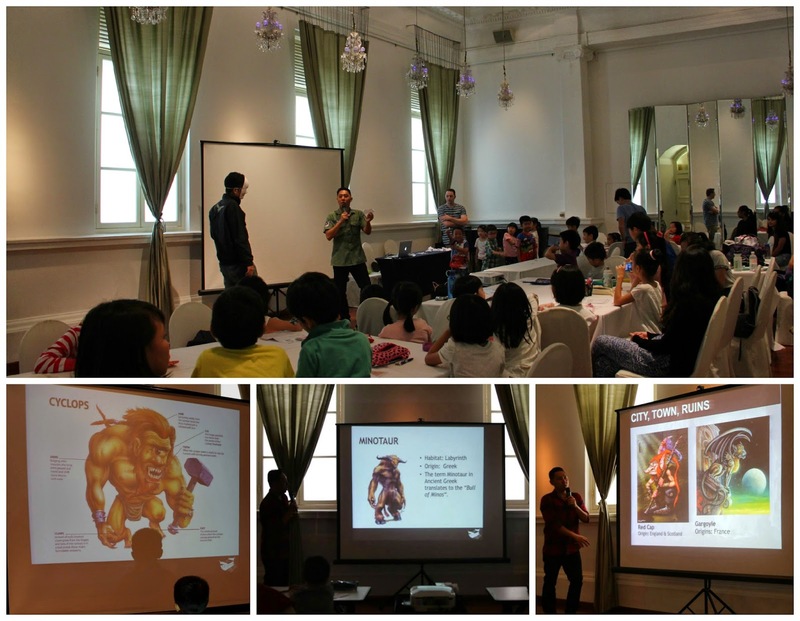 The kids not only got to know the names of these traditional monsters and see how they supposedly looked like, they were also told about their legendary powers, weaknesses, and their dwelling place, their habitat. After that brief sojourn into monster territory, the kids were given a Monster Builder to start work on creating their own monster/s. Fashioned like a worksheet, the Monster Builder prompted the kids to give their monster a name, describe or draw its appearance, set out the monster's behavioural patterns, list its special powers and weaknesses... Basically guiding the kids to flesh out their monster. How cool is that?! Very cool, and fun indeed, judging by how all the kids were working enthusiastically on building their monster. 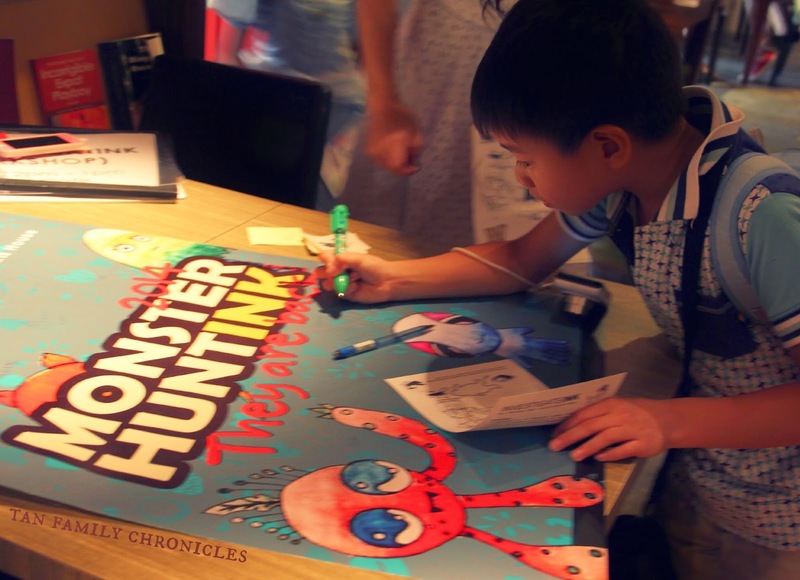 The next day, my friend, who sent her 8 year old daughter there to MonsterHuntInk, even asked if she could have a blank Monster Builder because her 6 year old son at home saw what his sister was doing and was keen to build his own monster too! Gosh, even I thought it was fun and was itching to start creating a monster as well! Flesh out your own monster with the Monster Builder! After creating their monster, the Monster Hunters needed to plan their journey over the raging seas and rough terrain to get to their Monster's dwelling place. They needed to have a plan for capturing their monster and correspondingly needed to make sure they were well armed to do so. They may even have a secret weapon. For all this, they had The Hunters' Guidebook, a document much like the Monster Builder, that prompted our brave monster hunters with well thought questions to prepare themselves for their noble quest of ridding this world of monsters and making the world a safe place once more. See how seriously our Monster Hunters take this monster hunting business? Frankly, I have never seen such a large bunch of boisterous children being so engrossed in writing before. The kids are split up into groups of about 8 to 10 kids, with a trainer and an assistant trainer per group. Using my incredible mummy eye power - it seems to me that the groups are roughly divided up according to age. Which makes sense since the workshop was for a wide age group of 7 to 12. I can imagine it works well in the sense that the younger kids would likely write simpler stories, whereas the older ones should be able to write more complicated stories. The trainers are on hand to give guidance and guide the monster hunters along. Monster Hunters hard at work, receiving guidance from Master Monster Hunters. 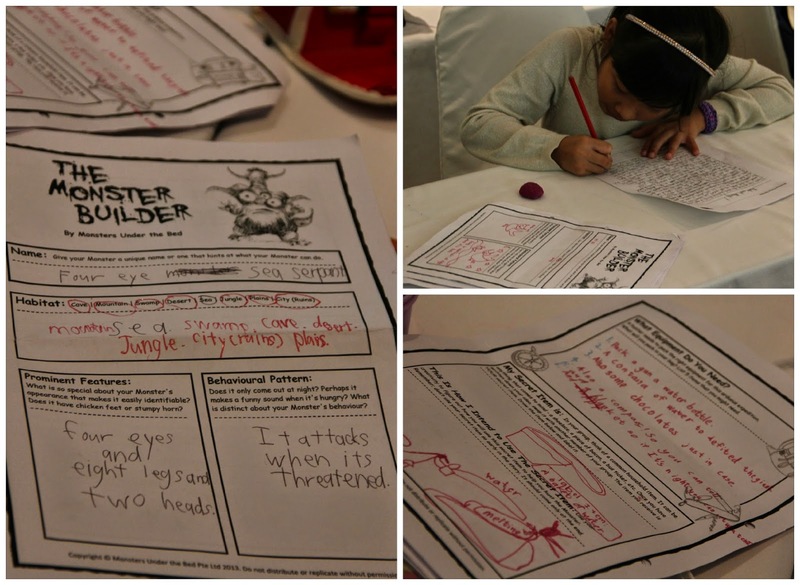 Using the notes that they themselves wrote in their Monster Builder and The Hunters' Guidebook, the kids wrote out the story of their journey and quest to hunt down the monster they created. For most of them, they were themselves were the hunters in their story. 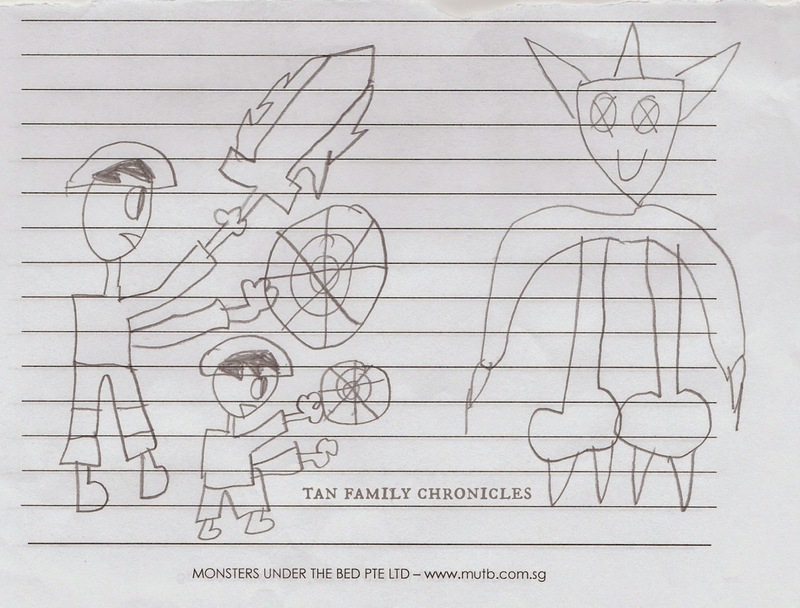 The portrait of the monster was meant to be on the front page of the story booklet each participant was supposed to have, with their own story written in it. So at the end of the 3 half days writing course, you have a booklet of your own story written in it. Nice! 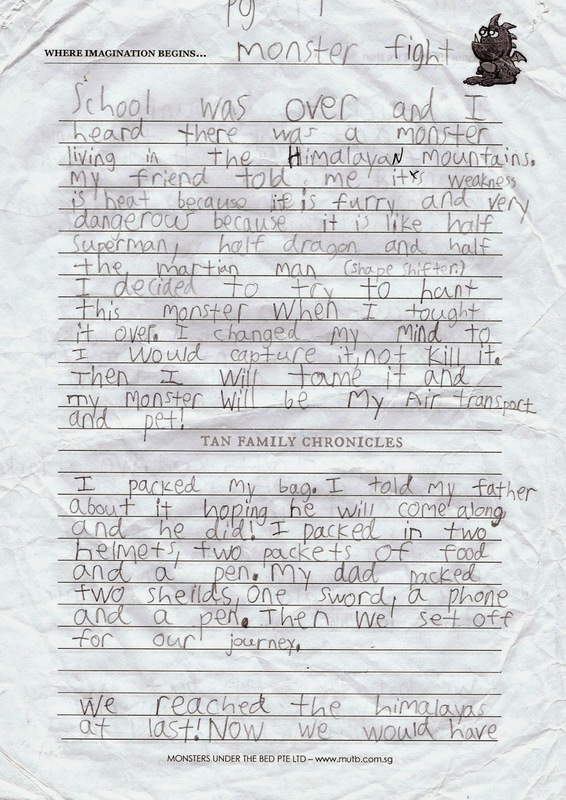 Except that for most of the kids I saw, the story which they had written was way too long for them to copy all into the booklet again before the end of MonsterHuntInk. It hardly mattered since the kids still had their story that they wrote on A4 paper. They could always copy it over when they are at home, I suppose. There was a small ceremony of sorts where some of the kids got to read out their story using a microphone, for everyone to hear. After which everyone said their goodbyes, and that was the end of another successful MonsterHuntInk. All in, I felt that it was a good use of theme to allow the kids' imagination and creativity the freedom to stretch and run wild, while guiding them to use descriptive words and action sequences to flesh out not only their monsters, but their journey and quest to slay or tame the monster. 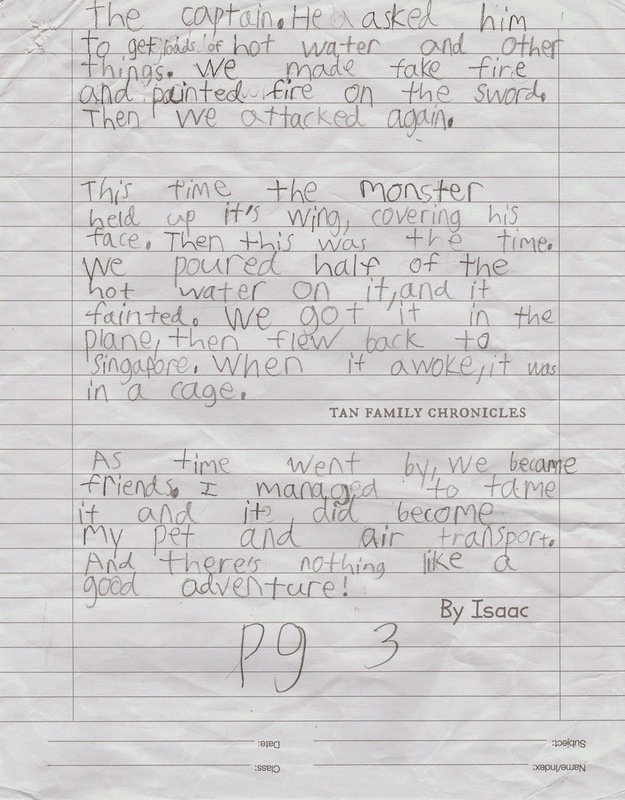 Below is 7 year old Isaac's story entitled Monster Fight. It won't win the next Pulitzer Prize or anything like that. And there is definitely room for improvement. But it's certainly quite a feat for a Primary One student to write something like that. I don't think I could have written this when I was in Primary One, that's for sure. And guess what?! My wish came true! 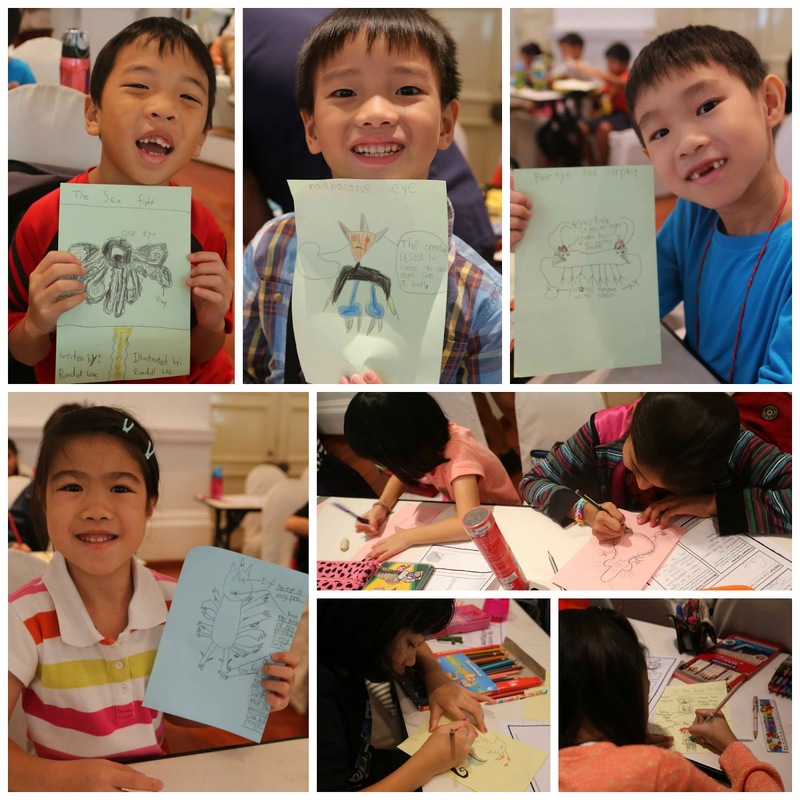 The next Monsters Under the Bed course coming up during this coming September holidays is InvestigateINK - an expository writing (creative non-fiction) workshop for students combining role playing with social interaction, analytical thinking, and writing skills. Trainers will simulate “crime scenes” in different rooms, replete with physical clues and “witness” actors. Participants will act as journalists in competing newspapers (player groups), who attempt to identify the culprit and motive. 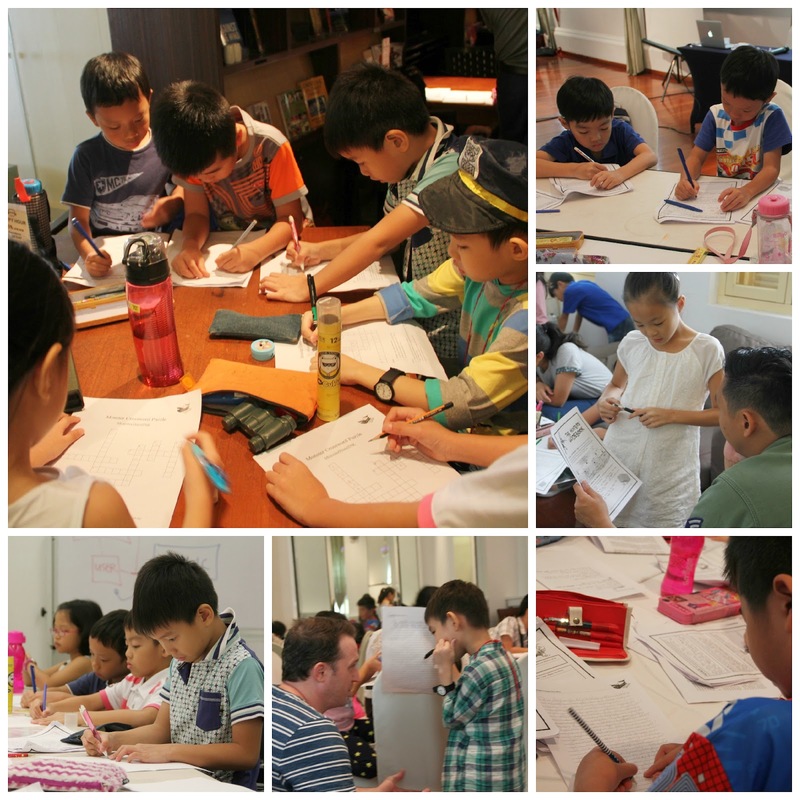 At the end of the workshop, the newspaper groups will be scored on the accuracy of their investigation, their conduct, and how well written their story is. At the end of the workshop, all participants will get a collage in the form of a newspaper, which contain their stories. How exciting is that?! Sounds like an episode of CSI come to life! Seriously, it's a perfect opportunity to introduce Isaac to reporting style of writing. 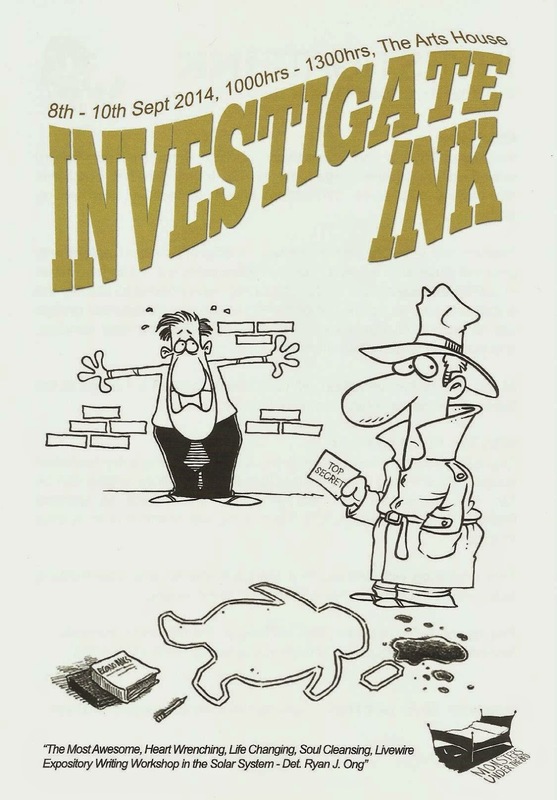 It's also reminiscent of the story books that he reads of young kids being investigators like Enid Blyton's Five Find Outer series, Hardy Boys and Encyclopedia Brown. If your child is between 6 to 12 years old and is interested in InvestigateINK, you still have two days to sign up! Registration closes this Friday 5th September 2014. Shoot any questions to you may have to info@mutb.com.sg Hope to seeya there! We're certainly looking forward to it!